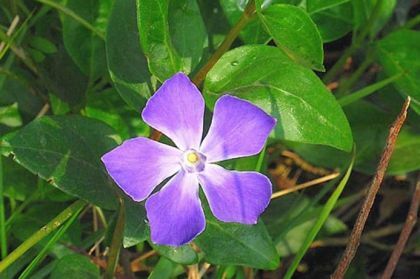 Greater Periwinkle is not easily confused with other wild plants on this web site. This beautifully designed flower is worth stopping to look at closely. 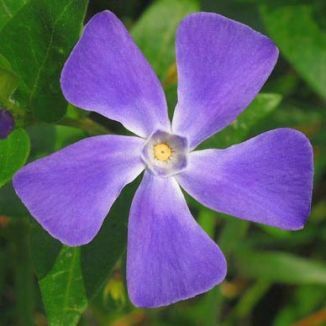 The violet-blue petals are fused together toward the centre of the flower, the corolla continuing into a short tube. The dark evergreen, shiny leaves are ovate and stalked with hairy edges. The 3-5cm solitary flowers are on show from March to May and this perennial can be found growing in hedgerows, woods and near houses. It spreads very efficiently because the stems root where they touch the ground. It is not a native plant, having been introduced from southern Europe into gardens. This plant belongs to the family Apocynaceae. I first found this flower in Killiney, Co Dublin in 1976 and photographed it near Wellingtonbridge, Co Wexford in 2005. This plant was thought to have several medicinal properties and was called 'Toute-saine' in France (all heal). Its Latin name – Vinca – comes from Vincere to bind or fetter.